IDEAL PHASE --- This is PHASE 1 of the analytical process of dissecting a technique. It requires structuring an IDEAL technique by selecting a combat situation that you wish to study. Contained within the technique will be fixed moves of defense, offense, and the anticipated body reactions that can stem from these moves. This PHASE reinforces the need to examine techniques from the MASTER KEY of LOGIC the THREE POINTS OF VIEW. WHAT IF PHASE --- This is PHASE 2 of the analytical process of dissecting a technique. The WHAT IF PHASE takes in additional variables and involves further analyzation of the IDEAL technique. The operative concept of the WHAT IF PHASE is that every movement has consequences, especially during combat. The WHAT IF PHASE allows you to project, evaluate, and learn various reactions you may be presented with outside of the suppositions made in the IDEAL technique. This increases your ability to alter or adjust (EQUATION FORMULA) the IDEAL technique to the situation and enhances your ability to make choices in the heat of conflict. FORMULATION PHASE --- This is PHASE 3 of the analytical process of dissecting a technique. FORMULATION involves the actual application of your alternatives to the IDEAL technique. Studying what can additionally happen within the framework of the "fixed technique", teaches you how you may apply your answers to variables in a realistic and changing environment. Further application of the EQUATION FORMULA will provide more answers and greater flexibility of thought. See EQUATION FORMULA. Knowledge / Remembering --- This would refer to the basic memorization of the ideal sequence of movements (The self-defense technique Glancing Salute, for example). Comprehension / Understanding --- The student needs to understand the primary function of the pattern of movement. Glancing Salute is a defense against a cross shoulder push. Application --- The student applies the pattern of motion against a number of different attackers in a variety of environments. Physically training the ideal phase of the technique to memorize the technique in the flesh. Etc. The variables are limited only by logic and your imagination. Synthesis / Evaluating --- This is the process of making choices (Adding, Adjusting, Altering, Deleting, Rearranging, Regulating, etc.) to adapt the ideal pattern to the new variables by applying the Equation Formula. Evaluating / Creating --- The means of applying (Formulation Phase) the original pattern (Glancing Salute) to the new variable (opponent precedes his push with a front ball of foot kick). By training the technique in all Three Phases, the student develops the ability to solve new problems (attacks that vary from the ideal) extemporaneously. This process can easily be applied to other traditional exercises (Forms, Sets, Freestyle Techniques, etc.) to allow the practitioner to build an unlimited number of "educational experiments" to increase understanding and build greater skill. A candid answer to the question, "Are you an expert at everything?" ---NO, but I'm Still working at it! 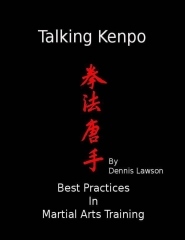 Dennis Lawson has trained for 4 decades in Ed Parker's Kenpo. During his varied career, Mr. Lawson has been an IKKA Regional Director for Region #3, has acted as Master of Ceremonies for the International Karate Championships, and has published numerous articles in publications for the International Kenpo Karate Association, The Martial Arts Learning Community (TheMALC), and Kenpo 2000. Mr. Lawson has had the opportunity to study other Martial Arts and holds advanced rank in Aikido and Takemusu Aiki Budo. Dennis taught, competed in, and promoted events in the New Orleans area for 20 years. Among his list of favorite achievements is choreographing and performing Kenpo for the Dance Council of New Orleans. His academic background in psychology and love of music allow Dennis to offer a unique and entertaining approach to tailoring "the Art" to the individual. Dennis has taught seminars in Ireland, Jersey Channel Islands, The Netherlands, Portugal, and throughout the United States. Dennis holds a Sixth Degree Black Belt in Ed Parker's Kenpo and was awarded the title “Professor” under the auspices of The Martial Arts Learning Community (TheMALC). Mr. Lawson was inducted into the International Black Belt Hall of Fame as Master Instructor of the Year for 2006. Some principles for more effective training. Instructor or Life Coach? – Teach Principles! Are you “training” or just “working out”? How Important is Your Curriculum? Are We Overloading Our Adult Students? Is your Martial Arts studio a breeding ground for student motivation? Self Defense, Safety, or Common Sense? Slips, Trips, and Falls --- Studio or Real World Safety? Colored Belts in modern Martial Arts or the "Rainbow Mudansha"
Dubliner Liam Brady is Guest Examiner for Black Belt Testing in Bethany Beach, Delaware U. S. A. Resolutions or Dreams and Goals? What is a Learning Community Anyway? Dublin Seminars - Three years and counting!